I had a request to make Chicken Alfredo for the birthday dinner to go along with the carrot cheese cake, from my last post. I have never made this dish before and I have eaten it only once, which the one time that I ate it the sauce came out of a jar. The Chicken Alfredo sauce that came from the jar was quite good, but I knew a sauce from a jar would not go over well in my house. So off to the web I went in search for a recipe that would be just right for this meal. I found several recipes, some that sounded tasty, some that did not sound too tasty and some that suggested that you use sauce from a jar. In the end I took several recipes and combined ingredients that I thought would make a delicious sauce. This recipe is not for the person who is watching their waste line, but what the heck you do have to enjoy life once in a while. The sauce is full of flavor; which is given by adding butter, cream cheese, garlic, and red peppers. I was a little skeptical adding the cream cheese, but it made the sauce super creamy. The Chicken Alfredo turned out better than what I anticipated and it received rave reviews. Heat a large skillet coated with olive oil, add chicken strips once skillet is heated and cook chicken until it is no longer pink. Remove chicken from skillet and set aside. Add the butter and cream cheese to the same skillet, stirring occasionally until melted and blended together. Once the first two ingredients are melted stir in milk a little at a time. Once the milk is blended in stir in the Parmesan cheese, once blended add the salt and white pepper to taste. Add the broccoli and red pepper and cook for about 3 to 5 minutes over medium heat, then turn down to low and simmer vegetables until tender about 15 to 20 minutes. Stir in chicken and continue to simmer until chicken is warmed through. Cook the Fettuccine pasta according to the directions on the box. 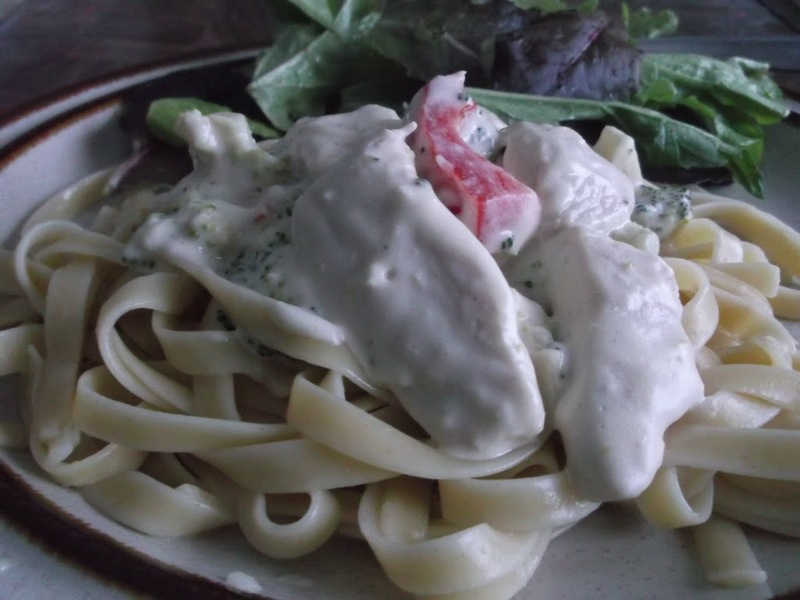 Serve the Chicken Alfredo over the Fettuccine pasta and enjoy. Looks terrific! 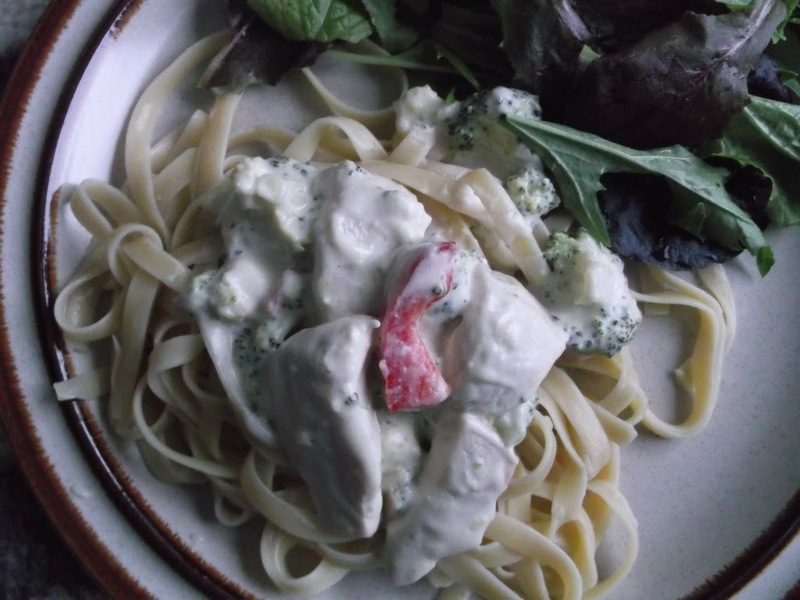 I make an Alfredo sauce with butter and cream, but I like the cream cheese variation. This looks so nice and thick! Lovely recipe – thank you. Yummy! 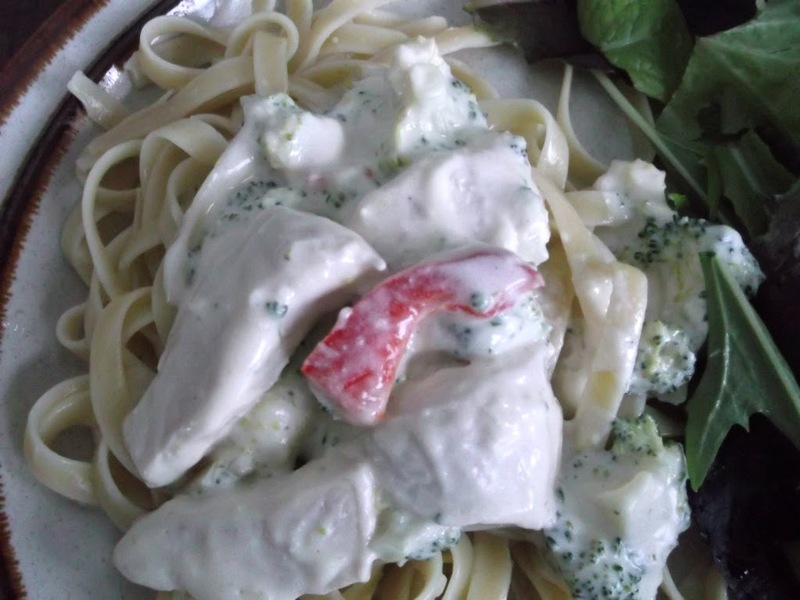 Love the creamy chicken…and it sure looks great with pasta…what a great meal.